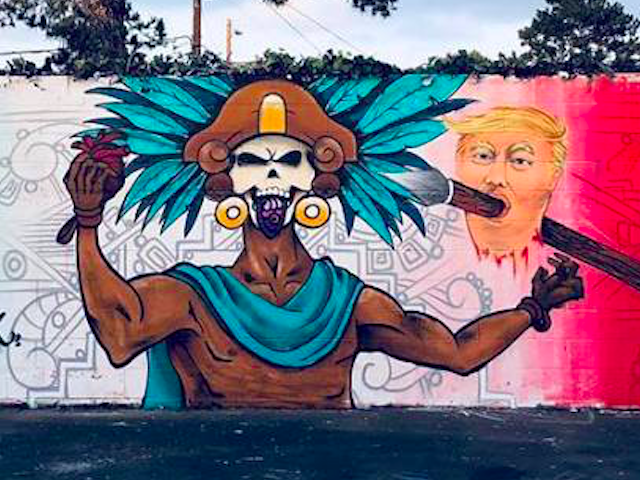 Artists in Chula Vista, California, who painted a school mural depicting an Aztec warrior carrying the severed head of President Donald Trump on a spear have decided to change the mural after a storm of protest. The mural also depicted the warrior holding a human heart — presumably, that of the president. The image recalls well-documented rituals of human sacrifice among the Aztecs, who are also thought to have eaten their victims. The mural was painted several days ago and then immediately covered up after local news reporters learned of it. Artist Sasha Andrade Mercado posted images of the mural to social media regardless, decrying what she called censorship. Several days later, the mural has been repainted to remove the offending image. A report by local ABC News affiliate 10 News indicates that the artists intend to repaint the mural of Trump elsewhere in the city. We decided to change the mural because there were threats made to the school from “white supremacist” and threats to the kids, we were just going to adjust the mural but when things got out of control and the school started receiving threats and putting the students at risk we decided to change it completely , other media outlets started to enter school property and not being nice about it for example KUSI News John Soderman walked in the schools reception demanding to see the mural with no respect what so ever they also did not do their research and gave out my name and my images without my permission and because of that is why I started to get hate threats. Last year, comedian Kathy Griffin sparked outrage by posing for photographs with a model of Trump’s decapitated head. She has since attended the White House Correspondents’ Association dinner ahead of a comeback comedy tour.